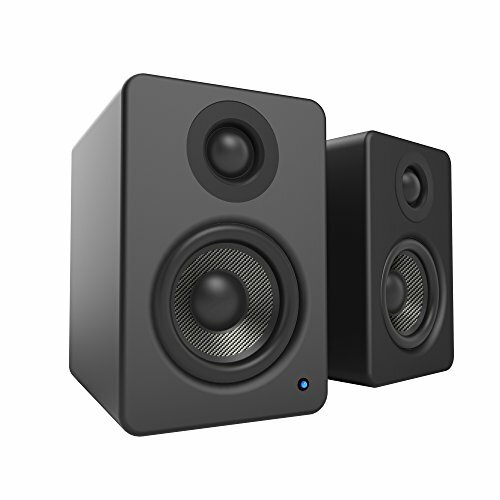 SMALL YET POWERFUL - YU2 Powered Desktop Speakers feature 3" composite drivers that provide distortion-free mid-range and bass tones, while 3/4" silk dome tweeters deliver clear and crisp highs. At just under 6" tall, these powerful mini monitors let you save space without sacrificing quality. CONVENIENT CONNECTIVITY - With its built-in soundcard, YU2 can stream high-quality audio directly from your computer's USB port. Its 3.5mm AUX input also lets you connect to any device with a headphone jack, such as a smartphone or an iPod. For extra bass, simply hook up a subwoofer via the SUB OUT port. CLEAN SOUND - The YU2's acoustic grade MDF cabinet features a sleek rear bass port that has been specifically designed and tuned to eliminate port turbulence while extending bass response. COMPLETE PACKAGE - You don't have to buy multiple computer accessories to listen to high-quality audio. YU2 comes with a power cord, speaker wire, a 3.5mm mini-jack audio cord, and a USB cable to connect the speakers to your computer. SLEEK DESIGN FOR HOME AND OFFICE - Personalize your living space or work area with Kanto YU2 Powered Desktop Speakers. Available with matte and gloss finishes in a variety of colors, the YU2s compact design makes them perfectly suited for any location.